Doctor Says I’m Normal . . .
Jan says it’s more like Abby Normal. When the labs came back from my recent doctor’s visit on the 19th of March, I was told that a number of my values were out of whack, i.e. calcium, kidney function, liver, electrolytes, etc., and they wanted me to come back in last week and do a retest. So today I was surprised when the doctor’s office called to tell me everything was fine, i.e., normal. So now I’m confused. Why were a bunch of my levels way out of bounds last week, but perfectly normal this week? Did they really need my additional $80 that badly? I’ve had a couple of requests from blog readers wanting further explanation on things I mentioned in the blog. 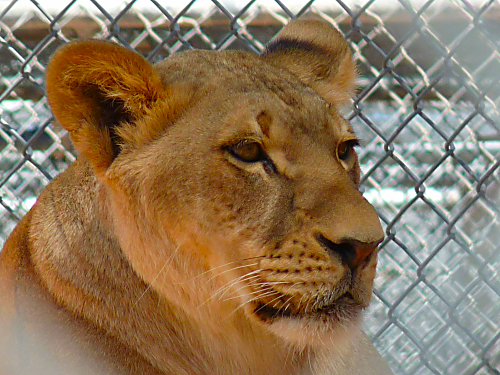 When I reposted the blog about our visit to the Cat Tails Zoological Park outside Spokane, WA in 2011, I mentioned wiring up a transfer switch bypass, and a reader wanted to know more about that. And when I posted my list of cars I’ve owned in yesterday’s blog, I mentioned a 1992 Ford Ranger that I broke in half on the Atchafalaya River Bridge in Louisiana in1994. So another reader just had to know the story behind that. I’ll posted more info on both these in the next couple of days. BTW I’ve already received car lists from several of you, so get yours in ASAP so I can post them here. 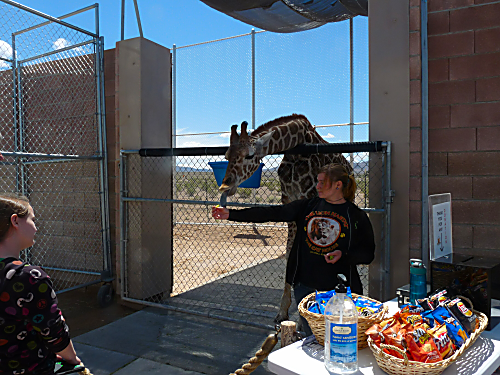 Finishing up I thought I’d repost another of our wildlife park visits, this one in Las Vegas. 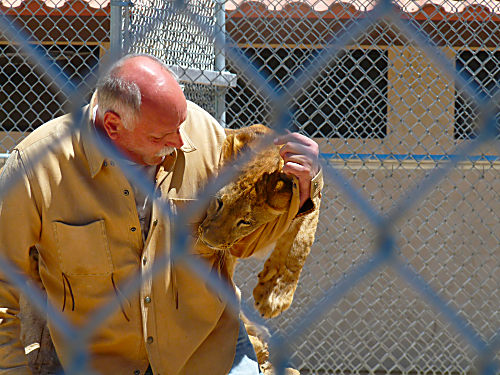 Jan and I left out on our latest lion safari about 10am this morning, heading for the The Lion Habitat Ranch down in Henderson at the bottom of the Strip. The park doesn’t open until 11am, in fact, it’s only open from 11 to 3 Friday thru Monday, but we wanted to have enough time to grab a breakfast sandwich somewhere beforehand. Getting down to the area, we double-checked the Ranch location and then drove another couple of miles down the St,. Rose Pkwy to the Jack in the Box located in the M Spa & Casino there. 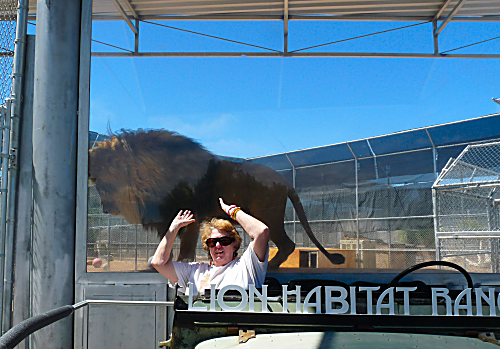 Ironically, the location of the M Spa & Casino was what led me to the Lion Habitat Ranch in the first place.. While we were still down at the Verde Valley TT, I read an article online about a guy who had killed himself at the M Spa on Easter Sunday. A guy named John Noble won a lifetime of free daily buffet meals from the M Casino in 2010, but then in 2013 was banned from the casino because he kept hitting on some of the waitresses and showering them with gifts. So to get back at the casino, on April 5th, 2015, Easter Sunday, the Casino buffet’s biggest day, John Noble went into the buffet area and blew his brains out all over the buffet, and I mean ALL OVER the buffet. So after reading the article and wondering where the M Casino was, I found it on Google. 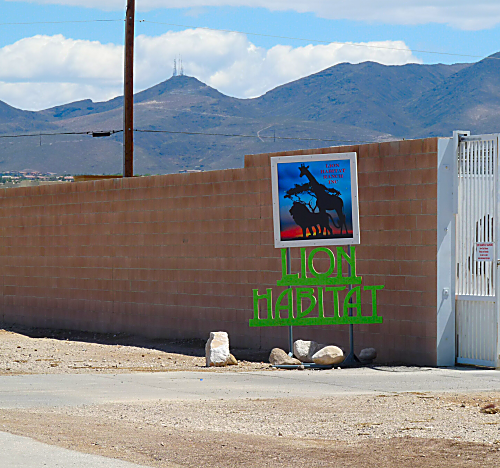 But I also notice a place called The Lion Habitat Ranch nearby, and made note to check it out when we were in Las Vegas. We got back to the park a little after 11am and found visitors already lining up. 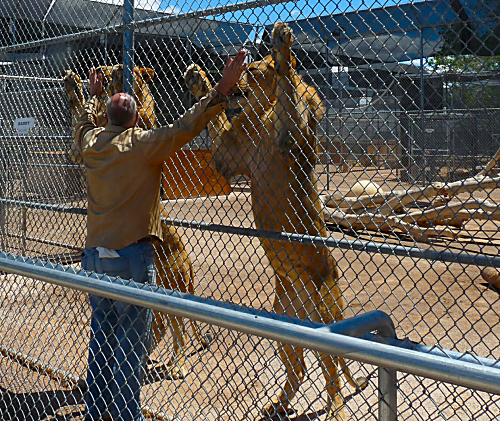 Our admission was $20 each with the $5 senior discount, about in line with other small family zoos. Our first stop was at a picture area. 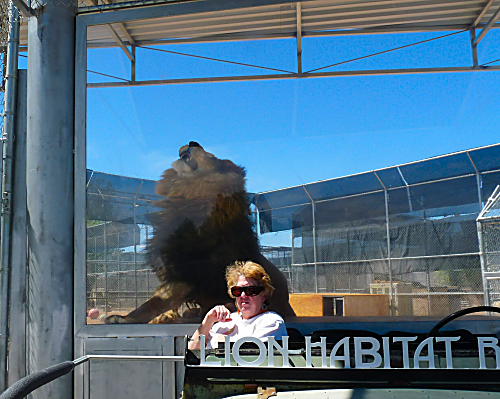 Visitors can sit in a jeep mockup and have their picture taken in front of a glass wall with a large lion right behind you. The lion is up there because a guy is off to the side throwing little chunks of meat to him. 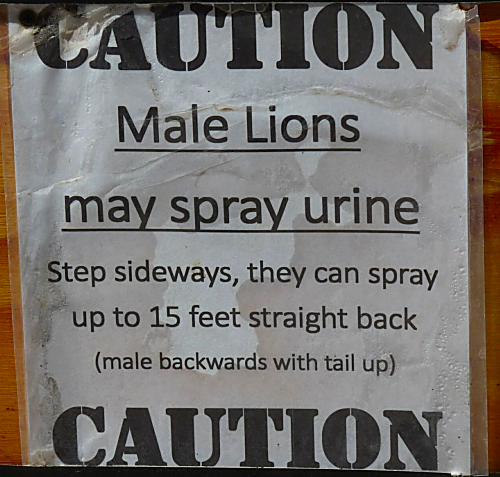 I guess this is the main reason to never tailgate a lion. Later we saw an example of this when one male decided he wasn’t getting his share of the meat chunks so he whirled around and sprayed. Luckily we were all able to scatter. This young lady had a lot of good information about the facility and the lions. All the 40 something lions are descendants of Leo, the original MGM lion whose roar you still hear in movie theaters to this day. 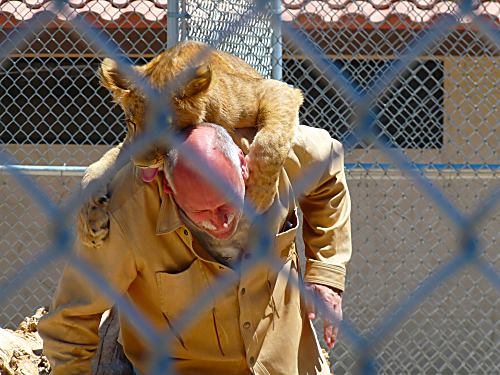 In fact, up until a few years ago, the MGM Grand Casino here in Vegas had a lion exhibit, using some of the lions from the ranch here. They actually were transported back and forth every day. Recently they’ve started adding other animals, including giraffes, ostriches, emus, and a number of parrots, macaws, and cockatoos. 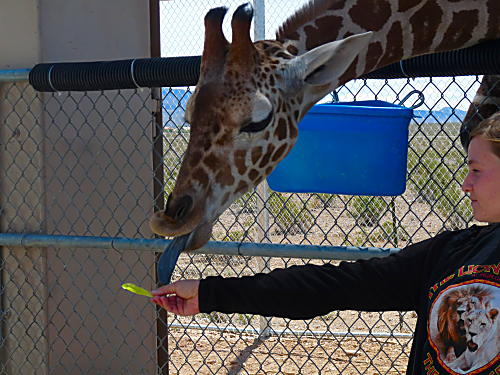 The handler here said that a giraffe’s tongue grows an inch for every foot of height, so a 20 foot tall giraffe will have a 20 inch long tongue. Yikes! I was able to get a lot of good shots of these big cats. 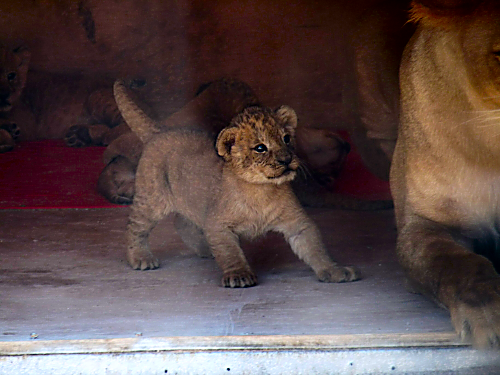 Back in the corner of this den box, are 5 of the 6 lion cubs born 23 days ago. 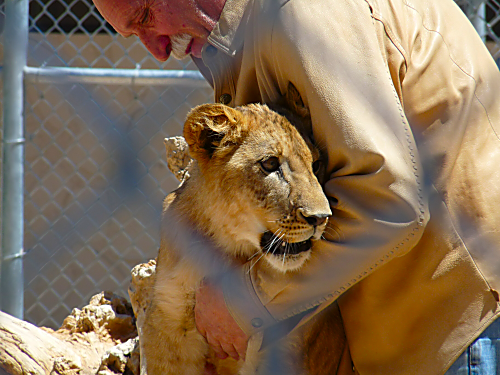 Unfortunately, the 6th cub died a couple of weeks ago. These six cubs are only the 3rd documented time that 6 cubs have been born alive. 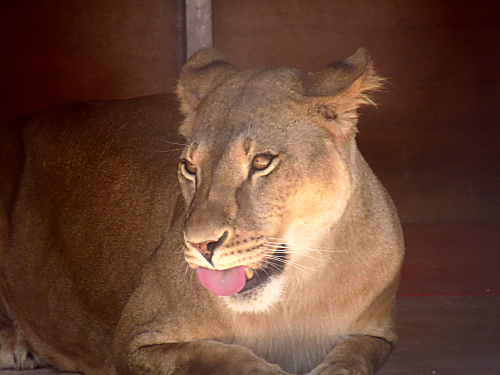 About 12:30 the owners came out and personally fed many of the cats, including the mother of the cubs shown here. 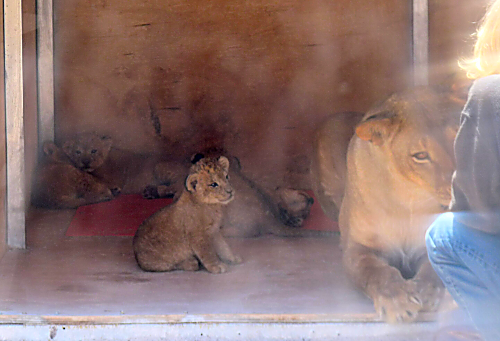 These cub shots were take through a thick pane of glass and were heavily shaded so I had to enhance them somewhat. Notice how the cubs at this age still have spots, for the same reason that fawns and other animals have them: camouflage in the brush. 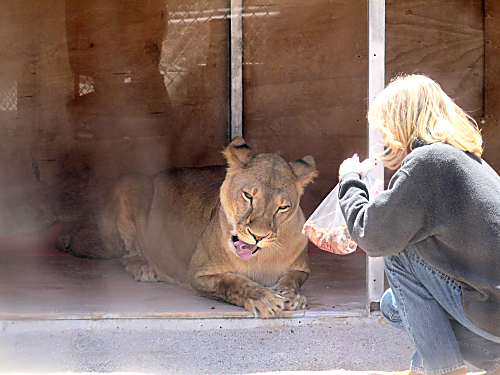 Every cat knew what they needed to do to get their meat snacks and were happy to perform. 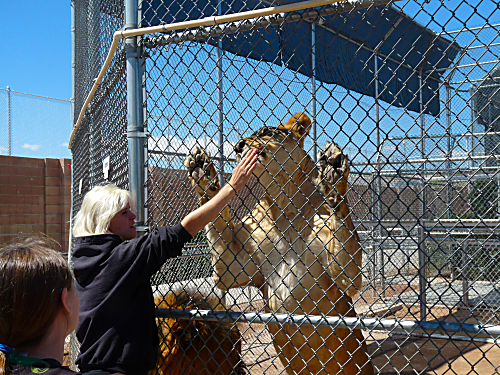 Having visited a lot of small zoos, we were both impressed with the cleanliness of the place and how good all the animals looked. 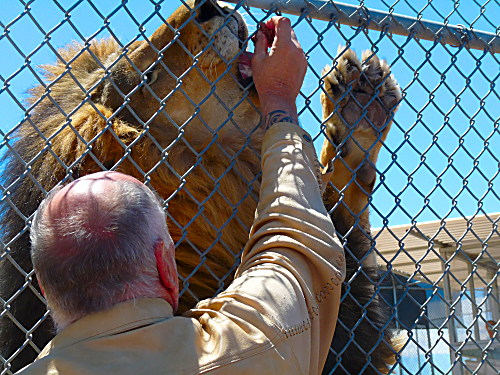 So if zoos and like-places are your thing, the Lion Habitat Ranch should be on your list. Leaving the area, we headed over to the Sunset Station area to have lunch at an El Pollo Loco, another of our favorite places. 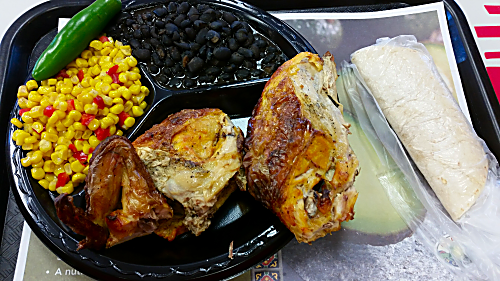 We love their marinated grilled chicken, and often buy extra to have later. And we plan on coming back later this week to do that before we leave here next Sunday. This was my 3 piece meal that was enough to have half to take home for dinner tonight. Yum! Coming home, we stopped off for some Wal-Mart stuff, and then getting back to the park area, we stopped in at the Roadrunner RV Park right down the road to drop off some Gypsy Journals. Tomorrow looks to be another nice stay-at-the-rig day. Looking forward to it.